The 49ers just announced they’ve signed guard Jonathan Cooper to a one-year deal. Cooper, 28, was the seventh pick in the 2013 draft. He broke his fibula during an exhibition game his rookie season and missed the entire year. He never seemed to recover from this injury. He started only 11 games in two seasons with the Arizona Cardinals before they traded him and a second-round draft pick to the New England Patriots for outside linebacker Chandler Jones. Cooper never played a game for the Patriots — they cut him four weeks into the 2016 season. Then, the Browns signed him, made him a starter for three games and cut him before the end of the season. 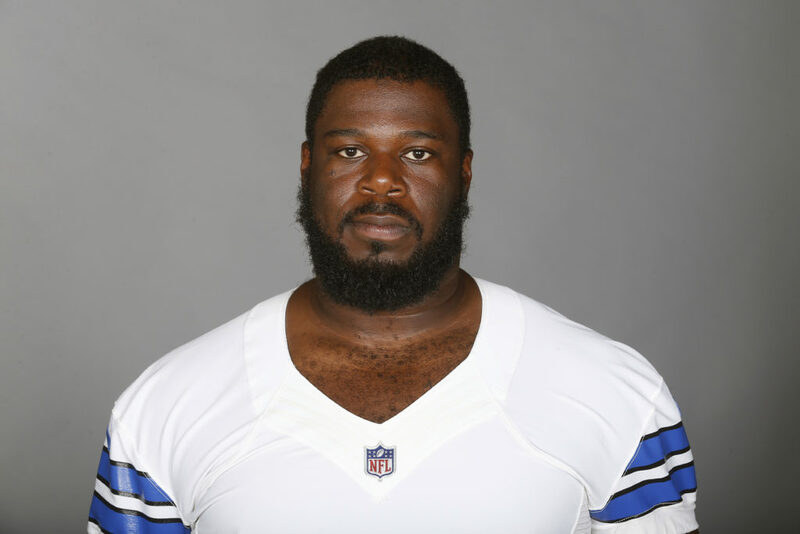 Last season, Cooper signed with the Cowboys. He was inactive for the first three weeks of the season, then became the starting left guard and kept the job the remainder of the season. But, he sprained his MCL during the final game of the season, and had knee surgery in January. The Cowboys made no attempt to re-sign Cooper this offseason, even though they don’t have a replacement for him. Cooper probably will make the 49ers 53-man roster. But if he’s a starter, the 49ers will have serious issues on the offensive line. Cooper is not a starting-caliber player. It was Scooter’s idea to bring him in, and I thought it made a lot of sense. As long as we can rid ourselves of Beadles, I’m good. He cant be worse than Beadles. Sadly, he could be twice as good as Beadles and still not be very good. In fact, he is twice as good. Beadles-juice had a 32 rating, and Cooper had a 67 rating. I like this signing. His career to date has been a disappointment, but he has been improving each year. OL often take a while to get up to NFL speed. He is an excellent athlete for the position, good movement skills. Should fit nicely in this system. Good addition to compete for a starting spot (though certainly won’t be handed one). Seems to me they’re content letting Tomlinson, Garnett, Cooper, Magnuson, Beadles and a day 3 prospect like, Tony Adams, OG, North Carolina St., fight it out for LG and RG…. Seems like five of the worst players on the roster. 🙀😺😺 you should be a niner scout . We would be in big trouble. I thought Magnusson played well last year. For the limited time he had, and the fact he was a developmental player, I liked Magnusson as well. He showed enough to indicate he can grow and serve as a backup this year at both guard and tackle. Good point. He was versatile and he kept Jimmy G upright. I’d like to see Nelson fall to 9 but don’t think it happens. Otherwise we need to leave the draft with guard/tackle in the first 4 rounds. We take Landry first, and then trade back up for Miller. Trade Brown for one of the Colts 2nd round picks. ^ Going back and forth between Landry’s combine stats and Khalil Mack’s is a lot of fun. Ha. They really could be 5 of the worst players on the roster. The hope is Garnett can compete with the body changes and they seemed to like Tomlinson more as the season wore on. Not sure what Cooper can do, but he played his best last season so we might have something to work with here. Beadles can go work for VD’s Smoothie store. and no amount of spin/disinfo will help them offload Beadles…. I Really dislike the disparaging remarks and attitudes being displayed about Zane Beadles on here….The man went out and lined up where he was told, gave it his best effort, played hurt, and was there for the next play….It’s fairly easy to tell which bloggers actually PLAYED football, and which ones sat back with their “glass of white wine…”and critiqued what they thought they saw…..Show some respect ! Some of that red was blood that they shed for our entertainment…Zane Beadles is a warrior…and I, for one, appreciate that…. Child, please. Beadles is not a warrior. Soldiers are warriors. Warriors get up in the morning not knowing if they’ll make it home alive. Al, come on, we are talking sports and it’s a metaphor for athletes. Don’t be so serious. Lighten up man. Seemed like Tomlinson got signficantly better once Jimmy G became the starter. So was it Jimmy or Laken? Also, I guess you can make an argument that a true pocket passer QB is easier for the OL to protect, because they have a pretty good idea of where he will be, and of course, for a guy like Jimmy, they don’t have to protect nearly as long. Contrast that with Beathard, or even Wilson in Seattle (but RW is uncanny in avoiding the rush). If Cooper improved last season, why didn’t the Cowboys want him back? Perhaps the Cowboy decision makers are as bungle prone as the 9ers. Oops. Cassie… Did the Cboys hire your dad under cover of darkness …? Cowboys haven’t been able to sign anyone. But he does, Dirty Deeds Dirt Cheap! Are Falcons fans and reporters asking the same thing about Fusco? Because it could give credence to multiple reports saying the Cowboys are thinking about moving La’el Collins back to LG. Maybe it’s true that Kyle doesn’t put a very high value on his OG’s? I wouldn’t rule out an OG before the end of day 2. But interesting that the 49ers now have 3 former 1st round picks competing for 2 OG spots. The talent is there, if they can harness it. John Benton will be tasked with doing all the harnessing, and I suspect he’ll have to reach deep down to pull out the best in these underachievers…. does not Benton’s own underachievement reinforce the underachievement of last season’s interior OL? I’m gonna move all my chips in on Magnuson winning the backup role. We’ve been crying and whining for the FO to do something about the interior OL. Rich burg was one. They probably expected to have Kilgore in the mix. So Cooper is worth a shot. They can cut him if they can do better. Tomlinson is a little better than some here think. I like Magnussen for depth. He was game in emergency relief last year. His greatest asset in the minds of some fans may be that they didn’t see him mess up as much because he wasn’t on the field as much. Versatility wins him a job. Who backs up at Center? I’m hoping Magnuson can back up OG, C and OT in a pinch, and do it better than Beadles. Good depth signing and brings competition to the position. John Lynch and Shanny continue to build it brick by brick. Are we only signing players that have a history of injury? There used to be a GM who thought he was clever to sign projects….. There is nothing wrong with projects as long as you do not draft them in the first three round or gear you long term plans on them coming through. You have to have alternative plans in place. Baalke not only over drafted projects but also assumed that they would all develop into their best case scenario. Looks like Lynch/Shanny are setting up a lot of guard hopefuls and figuring that it is possible that one might actually come through . This staff/front office always seems to have back up plans which is something that Baalke ignored. I’m impressed…he’s got good footwork…has he had a decent chance ? I’m intrigued with what I’ve heard about this Alliance of American Football league. Some good people involved with it so it may actually have a chance. Best part is, it’s a Spring League so there will be some form of Football during the NFL offseason for the first time since the World League. I don’t count the XFL. I have a cousin who is a huge Cowboys fan. He told me that Cooper started out slowly but got much better as the season progressed. Said that him being between two really good players in Fredrick and Smith allowed him to play well. Between Staley and Richburg may also allow him to flourish. I expect the team to draft a guard by the end of the 3rd round and let them compete for the starting spots. The fact that Cooper will be competing for a starting job tells us a lot more about how they view Tomlinson and Garnett than it does about how they view Cooper. They are basically telling Tomlinson and Garnett that they stink. Remember that Shanahan always likes to have options. He will seldom put all his eggs into one basket. He is just increasing the odds that one of them might turn out. Baalke would sign one player and expect them to come through. He is not convinced that Tomlinson or Garnett stink, he is just hedging his bets. Doesn’t hurt to add a player to compete. Another Baalke 1st Rd bust. Baake 1st Rounders, the gift that keeps on giving. Any relation to Earl Cooper the Niners first round pick in 1980? Ran up tempo offense in college. is considered a very good fit for the zone scheme because of pass blocking and athletic ability to get to the second level. Can pull left or right. As someone mentioned, he started out slow with the cowboys but got better as the year wore on. Definitely injury concerns from school which have continued into the pros. Has a lot of potential if he can stay healthy. No, but I do know the tell-tell signs of a troll. Thanks #80! That is a good read. It appears by this article that Cooper might also be suited for Shanahans system. The has the physical skills to do well. If you’ve never watched a Richard Sherman presser, below is a link to today’s presser. I was surprised by how engaging and down-to-earth he seems. He is confident (some would say cocky), but I really enjoyed how he engaged the press and didn’t shy away from any questions. After watching his presser, I thought of that Star Trek episode where Kirk is split into two: his civil, generous/kind but docile self and his emotional, cruel, but take action self. He is engaging and very articulate. Never been a fan of Sherman…..guess I am now that he is a Niner. Words to live by. Successful people, in every walk of life, always have a plan A, plan B, and plan C.
A+ to Lynch and Co. for having a plan and implementing it. I’d take their plan Z over, well, need I say? Exactly! They are keeping plenty of options open when a clear plan A has not developed. Does the Cooper signing change the 49ers draft needs in a significant way? I thinking guard is still a target. Corner too, even though with Sherman. Yes ! They will always look to improve their roster. This way they are not locked into reaching for a player in the draft when a Plan A player is not available, because they already have some plan B’s and C’ in place. Cooper just provides flexibility. They want to be in a position where they don’t “need” a rookie to start right away. I don’t think it changes the 49ers main needs being DE, OL and CB. More competition , even a little more , is always better . Yeah think this will be addressed early on in the draft. Probably in the first three rounds . Niners are doing good job this off-season.Not throwing long term money away. Great to have someone running things with some sense of purpose. Another great draft or good(b) draft and you looking @contenders for next at least 5 years. Would love to see a big wr/te red zone acquired but there are some in draft. Also is OT Gilliam enough at backup tackle spot, I think a versatile OT/ OG would be perfect to finish off line.